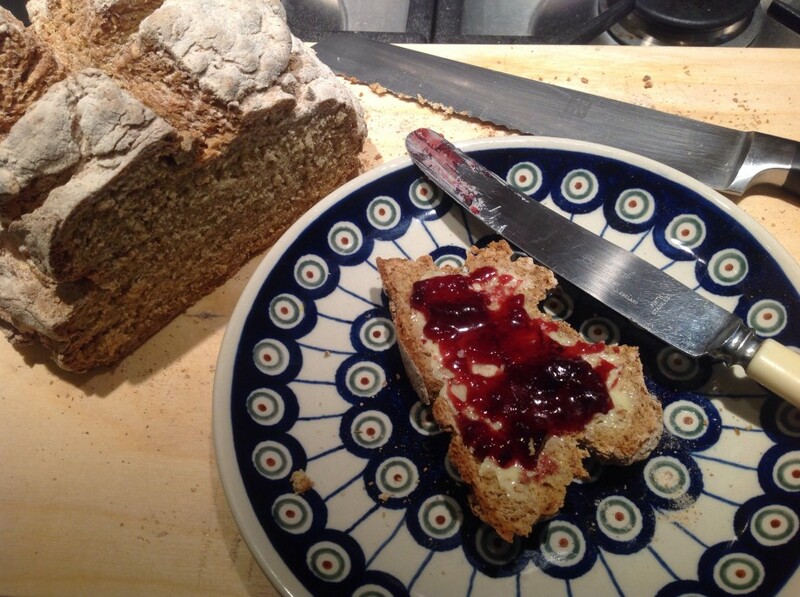 The Jim score: Unknown because he hasn’t ever had soda bread before, but top marks from guest judges R and G.
And yet again it’s been a really long time. SIX months in fact – that this coincides with the length of time I’ve been in my new job kind of tells you how the transition has been. So finally I planned in a free day at home and after reading that this challenge would be a doddle, felt rather pleased that it was something I could start and finish in a jiffy. I did some minimal research for recipes, looking at Felicity Cloake’s perfect soda bread, one from Delia’s archive and they both had too many ingredients which meant I would have to use my overworked brain, so from pure laziness I used the most simple and straight forward recipe I could find. That was Hugh Fearnly Whittingstall’s. 15 minutes prep time, 40-45 minutes baking and DONE. And he wasn’t lying. It was just the ticket to reintroduce me to challenges. Preheat the oven to 200 degrees centigrade. 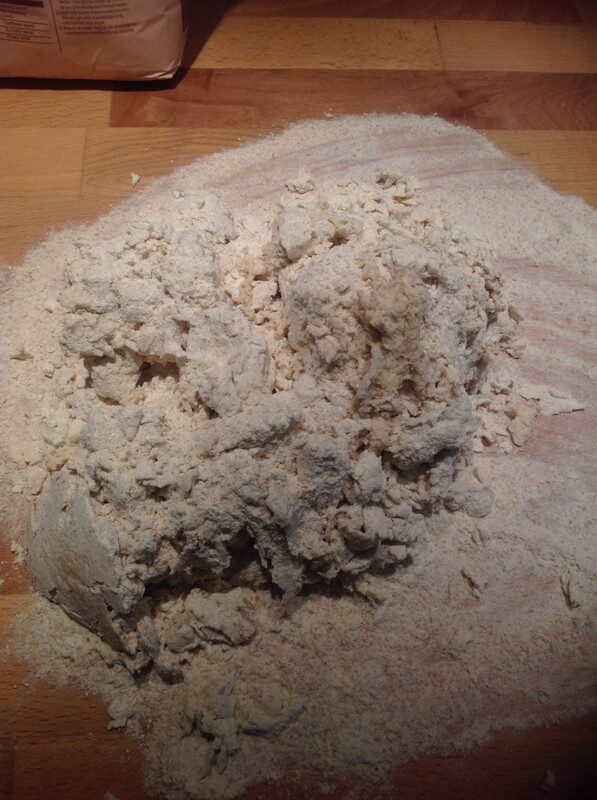 Take the flour and bicarbonate of soda and sieve it into a large bowl – if you’re using flour with extra texture like the wholemeal flour I used, add that in from the sieve. 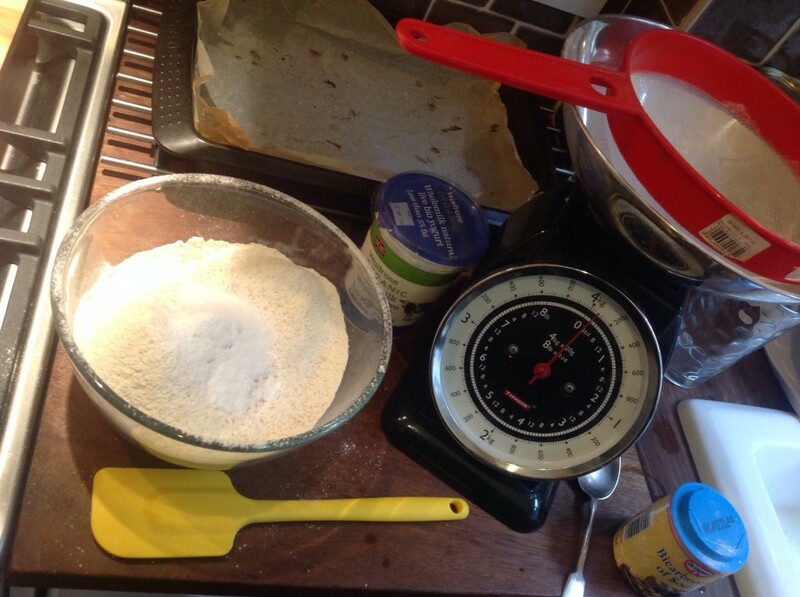 Then, make a well in the centre of the flour mix and add the yoghurt, mixing as you go. It looks like a big lump of mess, and at this stage I added a little more yoghurt to make sure it all bound together nicely. 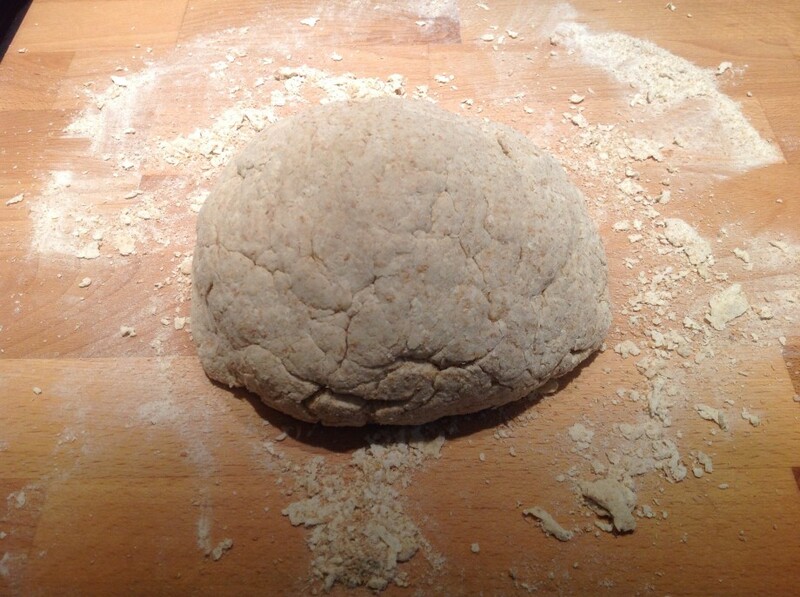 Tip the messy lump out onto a floured surface where you can kneed the dough for a minute or two. Hugh says not to overdo this as you want to act fast, whilst the bicarb is still going its thing. It took a little bit of squashing together but I finally had it in an unpromising looking lump. 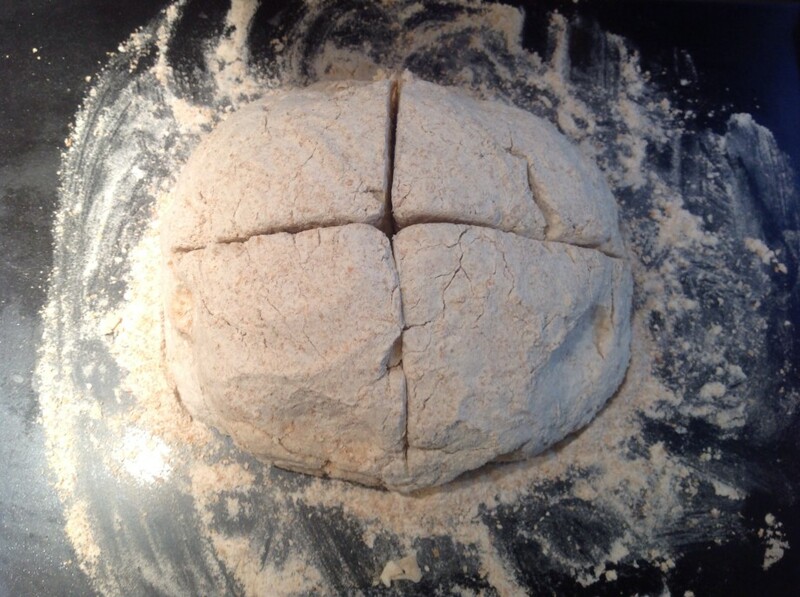 I trusted the recipe and made a deep cross cut across the centre of the mass – two thirds down the height of the lump. 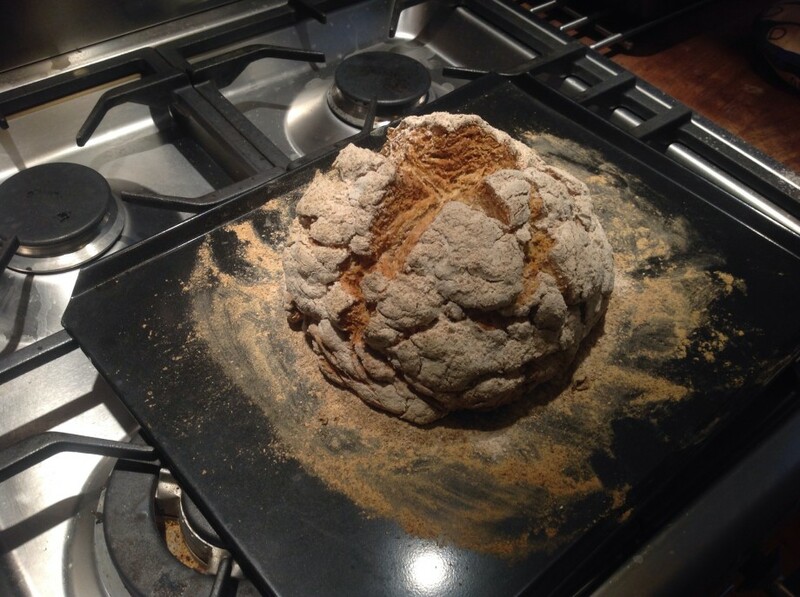 Popped it on a floured baking tray and shoved it in the oven. Off I wandered on my blissfully free afternoon to potter whilst the bread finished. Fully expecting to take it out of the oven and be presented with a total mess, I was very pleasantly surprised when I retrieved it after 45 minutes (tap the bottom of the bread and so long as it sounds hollow, it’s done). So that was that! A quick taster with a cup of tea, then we had it for supper with some baked fish and roasted vegetables, and again the following day with a chicken stew. I would make it again, and definitely liven it up with some nuts and oats to give it some more bite. Well done. The HFW recipe is the one I usually use, and as you’ve discovered, you really can go from thinking “I fancy bread” to munching on a hot buttered slice in under an hour. I like it best, fresh out of the oven, with lots of butter. Jam too, is good. Yours looks great – I hope it will become a regular addition to your repertoire. 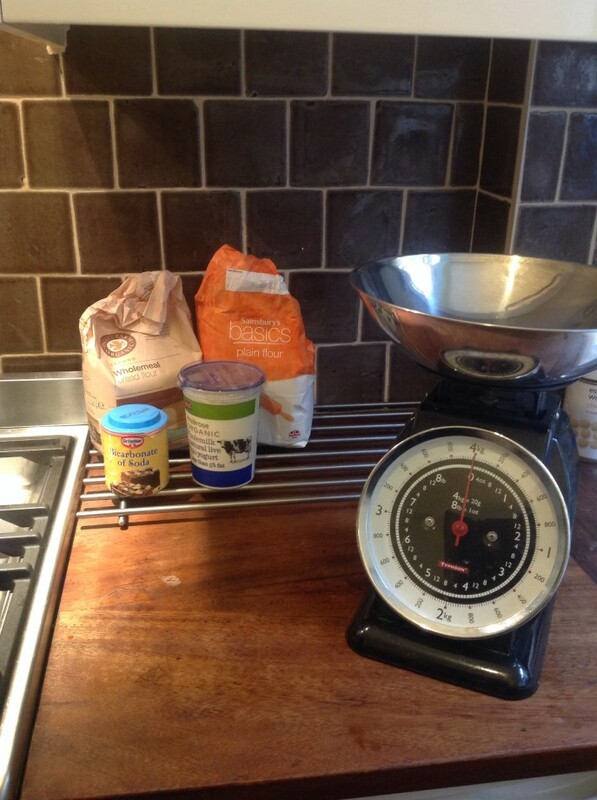 And there are many ways you can vary the basic recipe – the possibilities are endless!